Rebecca Spit Marine Provincial Park – a narrow hook of land on the east side of Quadra Island – is an excellent area for beach exploration and picnicking. Sandy beaches line both sides of the 2-km spit at this popular day-use park overlooking sheltered Drew Harbour, a favourite anchorage for boaters. Walking trails lead along both sides of Rebecca Spit and offer ample opportunities for exploring the beach, which contains a high concentration of driftwood. Swimming, fishing and kayaking are all popular activities at Rebecca Spit’s large picnic area. Facilities include picnic tables overlooking the beach, a grass playing field and wheelchair accessible pit toilets at the boat launch parking area and at the southern parking lot. Bring your own drinking water as potable water is not available in the park. The more than 2 km sand spit is a unique natural feature. The eastern shoreline at Rebecca Spit is also known for its high accumulations of driftwood. Rebecca Spit is located on the east side of Quadra Island at Drew Harbour. Visitors can reach Quadra Island via BC Ferry service from Campbell River on central Vancouver Island. From the ferry terminal, follow signs to the Cortes Island Ferry and the park. The closest communities are Quadra Island and Campbell River. History: This area named for early Spanish navigators who explored this coast in 1792. Conservation: The park consists of open uplands interspersed with stands of mostly second-growth trees, shrubs and grasses. An unusually high concentration of driftwood accumulates on the sandy spit at this park. There are paddling, canoeing and kayaking opportunities at this park. Paddlers can set in at the boat launch and enjoy a scenic paddle around the bay. Bicycles must keep to roadways and are not permitted on the trail around the spit. This rule is strictly enforced and is a ticketable offence under the Park Act. Bicycle helmets are mandatory in British Columbia. Ocean fishing is permitted as per provincial and federal fishing regulations. All anglers should check the current regulations issued by Fisheries and Oceans Canada prior to fishing. Anyone fishing or angling in British Columbia must have an appropriate licence. A short, easy trail leads around the perimeter of the spit. For your own safety and the preservation of the park, obey posted signs and keep to designated trails. Shortcutting trails destroys plant life and soil structure. 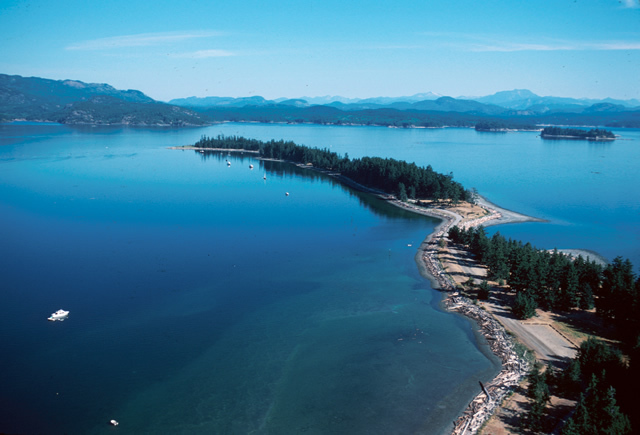 The waters around Quadra Island are considered to be excellent for cold water scuba diving. Dive tours can be arranged through commercial companies on Quadra Island, Campbell River and the Comox Valley. There is no designated swimming area at this park; however, swimming at the sandy spit is very popular. There are no lifeguards on duty at provincial parks. There is a boat launch at this park, located on the west side of the spit near the park entrance. The waters around Rebecca Spit are popular with boaters. Sheltered deep anchorage is available in Drew Harbour on the west side of the spit. Sewage discharge in the Harbour is prohibited. This park has a large day-use/picnic area located on the sandy beach. Picnic tables run along the spit. Other facilities include pit toilets (2 are wheelchair accessible), a grass playing field and information shelters. Bring your own drinking water as potable water is not available in the park. Pit toilets are located throughout the park. Pit toilets located at the boat launch parking area and at the southern parking area, are wheelchair accessible.